2011 has seen filming continue on Doctor Who, with work being completed on Matthew Graham's two-parter during the first week of January. Filming took place at Atlantic College in Welsh St. Donats, picking up from filming that needed to be completed from an earlier visit during December. 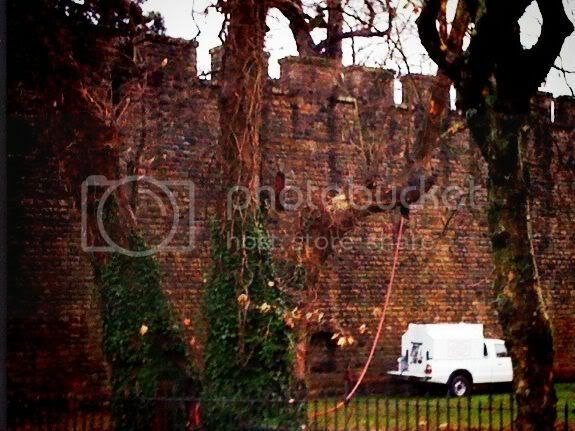 This was followed in the middle of the week by pick-ups back at Cardiff Castle, and then finally at the end of the week at the Senedd at Cardiff Bay. 16:20 So wished I could've spent more time on set. Lovely team. Very friendly and very Up. Oh and very, very cold. 20:34 My DW 2-parter finishes shooting end of this week. They will be glad to come in out of the perishing cold. Poor dears. Ryan Farrell, 3rd January: Followed the signs to St Donats, where they've resumed today. Went round the back of the castle to the beach, then walked back towards the castle and heard a familiar Highlands accent before seeing Karen being escorted into the castle. 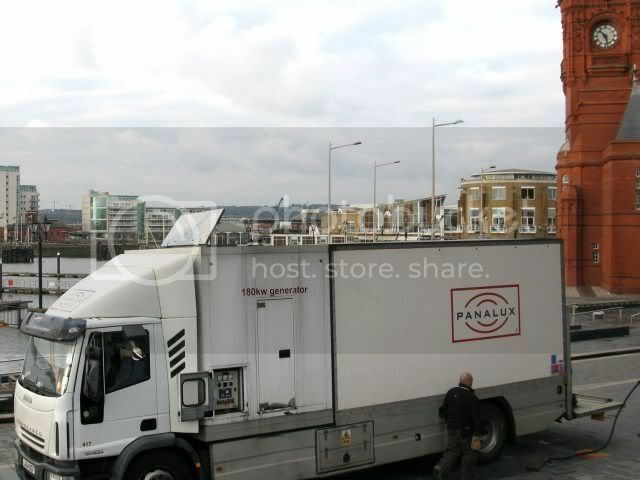 Nothing to add to that, other than trailer 3, which I think is Arthur (he says which number trailer he uses on his video diary). 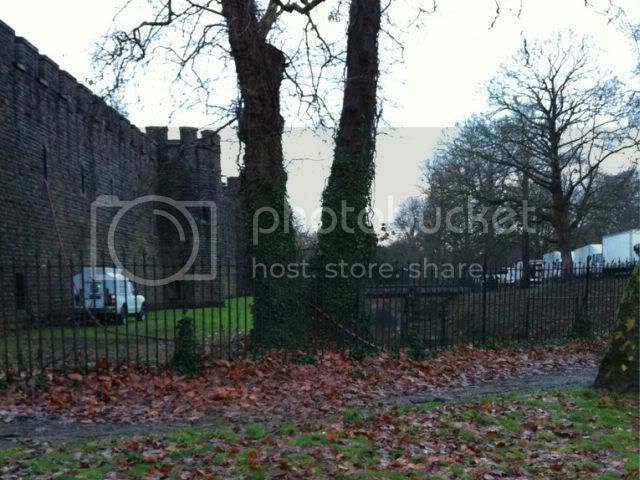 Ryan Farrell, 5th January: Filming was back at Cardiff Castle today. Saw an actress with Cleo-style black hair with a straight fringe, 100% Sarah Smart. There was also a "Mark" and I googled Mark Bonnar who's down to be in this story and that's also 100% him. Finally, there was a "Leon" and that was Leon Vickers. The only new bit of info is that I think Leon or Mark (who we don't have names for yet) is called Timmy/Jimmy/something similar. Alun Vega, 8th January: Seems it was a night shoot at the Senedd. Spotted Karen and several smart-suited supporting artists leaving. Base packing up. 13:59 Okay. Episode 7 of the new series, is the 777th episode of Doctor Who. 14:01 Oh, and we just started shooting it. Filming took place at Lafarge Aberthaw Cement Works on the 11th January, during which an old adversary of the Doctor's was spotted! With Moffat's comments above, it isn't clear whether this filming is for the new Block 4, or the final batch of filming for Block 3. However, the 13th certainly did see episode seven filming taking place at a (currently unknown) power station. There was a day's set-up on the 10th at the works, before filming itself took place on the 11th. The interior of one of the buildings was dressed to represent what looks like a makeshift military medical centre, in somewhat disarray. Alien writing could be seen on trolleys, and throughout the set were a stylised cross that looked a little like those of the Knights Templar! Outside, the TARDIS was set up, which appeared to be menaced by a Sontaran trooper! 08:34 Doctor Who filmed at power station overnight. 20:53 Re doctor Who, all I can say is monk aliens and teleporters.